Our entire family has been following the elections very closely. Knowing that Ohio is a key state in the home stretch, I did some research and found out that tomato juice was its official beverage. It's not warm enough to make tomato juice, so I made a warm tomato soup, using the very last batch of tomatoes in our garden. 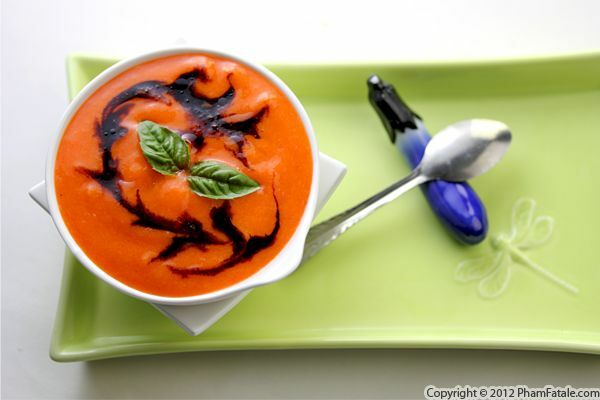 I blended the ripe tomatoes with roasted red bell pepper, fried yellow onions, garlic, cumin, clove, fresh basil and crème fraîche. The result was very soothing and, to my surprise, the soup turned out very sweet and not acidic at all. My husband Lulu has been stuck in bed for the last 2 days because of a bad cough. I made a comforting vegetable soup to soothe his throat. The ingredients of the soup are pretty standard. I used leeks, carrots, turnips, oregano, green onions, green peas and potatoes. 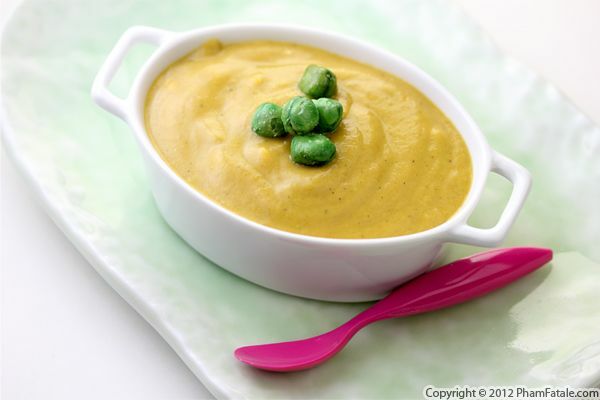 For added crunch, saltiness and as a reminder of the flavoring in the soup, I topped the soup with fried green peas. When I became a mom, I told myself I wouldn't become the kind of annoying mother, oversharing baby photos. 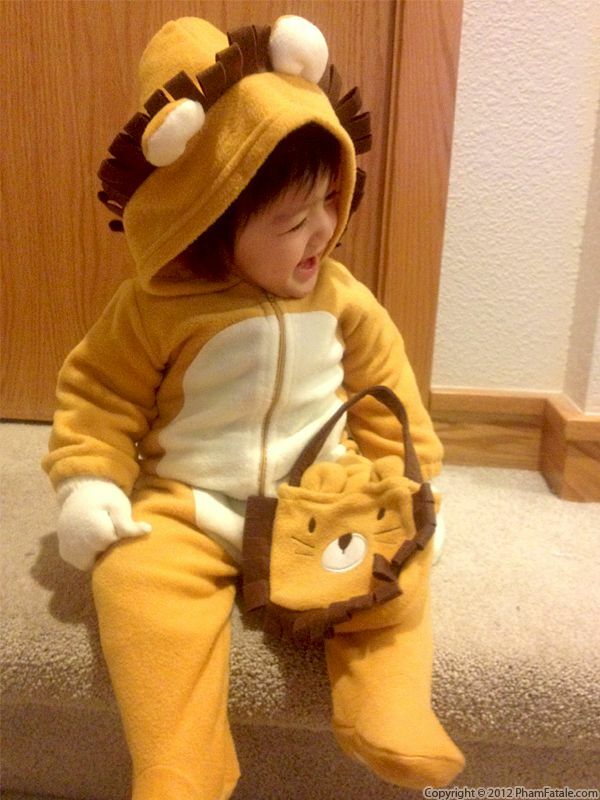 So with that in mind, here's a really cute picture of my daughter Aria in her first Halloween costume. Isn't she a cutie pie? We're finally back home to the Bay Area after our trip to Europe. Surprisingly, the weather in Paris was a lot warmer and more pleasant than California. It's been raining quite a bit here. 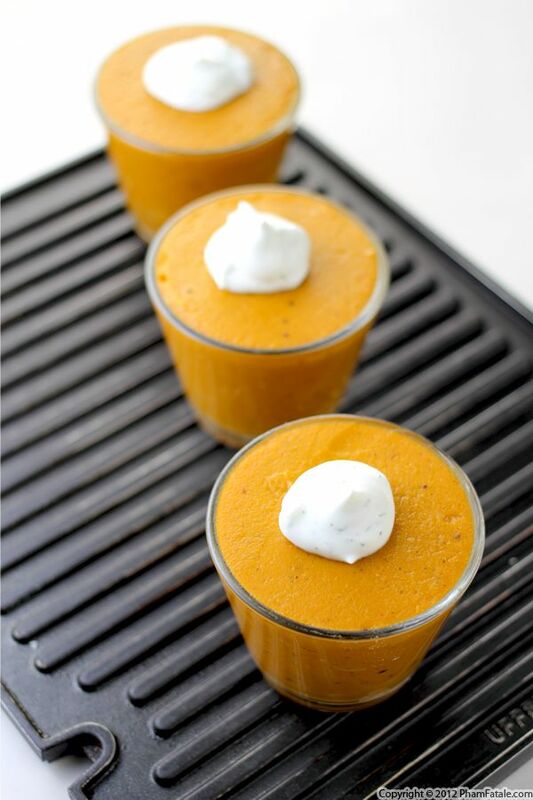 With Halloween coming, I picked up 3 small pumpkins and made comforting creamy pumpkin soup to ward off the cold. The preparation is fairly easy: roast the pumpkins, add a little molasses, puréed sunflower seeds and cream and you're good to go. I paired the soup with grilled slices of baguette bread, so my husband Lulu and I could reminisce about the wonderful time we just had in Paris. I'll be posting a lot of photos of our recent trip very soon. Stay tuned! This weekend, we had a quiet dinner with only my family and I decided to make my dad the Vietnamese dish I think I make the best. 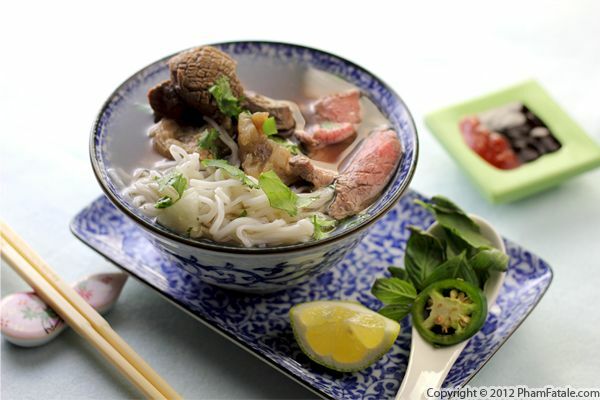 There are several variations of Vietnamese beef noodle soup; I wanted to make Papa’s favorite, which is the one with beef tendon, called phở bò tái gân. We watched la Météo (weather forecast) yesterday on TV and it seems it's going to be raining all week!.The clear broth is absolutely delicious and it's perfect if you feel under the weather, which seems be happening to us given the rain! Since we arrived in Paris, my husband Lulu and I have taken the opportunity to have romantic getaways in Europe and leave baby Aria with my parents. My parents are thrilled to get to have time alone with their granddaughter, and thankfully, so is Aria. As the crazy mom that I am, I've left a long list of instructions for my mom to ensure the happy well-being of my baby girl, and that includes what she eats. Ever since Aria started eating solid food, I've managed to feed her only homemade baby food. I use the term baby food loosely, since I only feed Aria food that I would also eat. 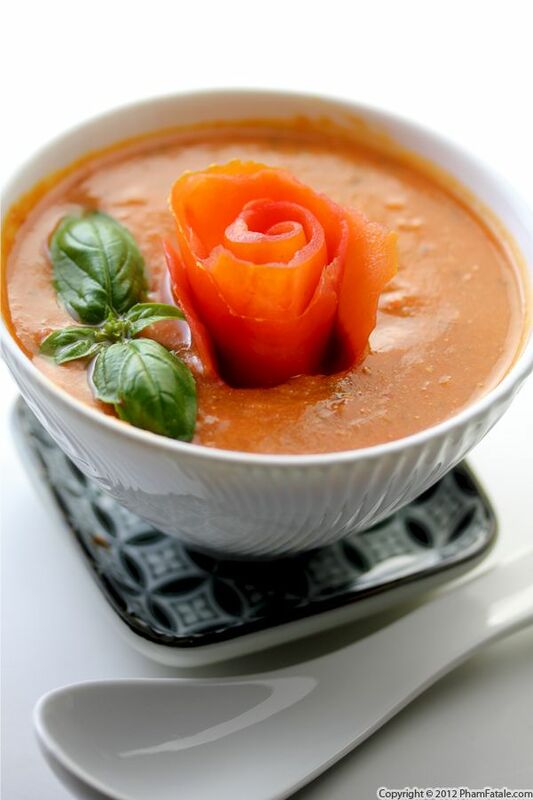 I've taught Maman one of Aria's favorite soups: roasted bell pepper soup. It's a healthy blend of lentils, brown rice and roasted bell peppers. When Lulu and I came home, there was still some soup left, so we all ate it as a first course. I garnished it with sweet basil and a drizzle of balsamic reduction. It's fantastic! Page 12 of 18 pages.